Alan Richmond has worked at Space Telescope Science Institute since August 1988. He was primarily responsible for enhancements to the Proposal Entry Processor software system, and for software associated with the user interface to the Space Telescope data archive. 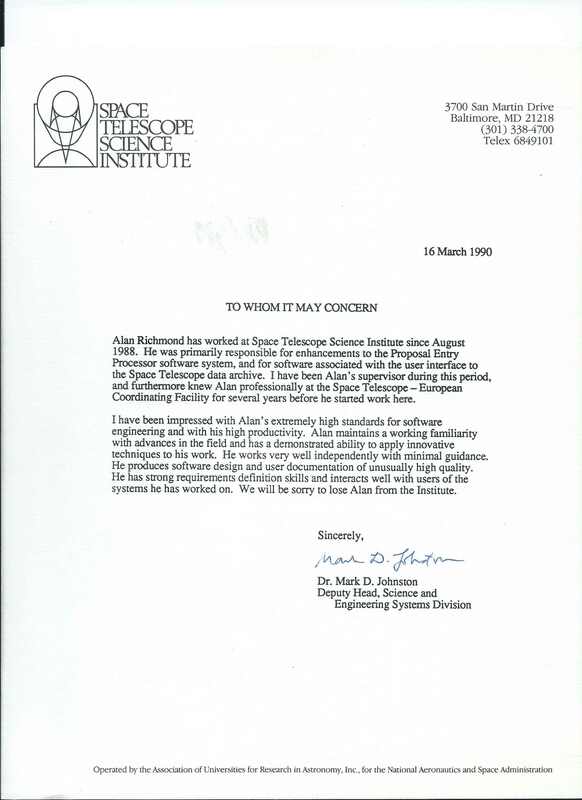 I have been Alan’s supervisor during this period, and furthermore knew Alan professionally at the Space Telescope European Coordinating Facility for several years before he started work here. I have been impressed with Alan’s extremely high standards for software engineering and with his high productivity. Alan maintains a working familiarity with advances in the field and has a demonstrated ability to apply innovative techniques to his work. He works very well independently with minimal guidance. He produces software design and user documentation of unusually high quality. He has strong requirements definition skills and interacts well with users of the systems he has worked on. We will be sorry to lose Alan from the Institute.